Octavia Spencer is so cool. I’ve seen quite a few of her films and I want to see so many more. She made an amazing Minny Jackson in The Help (2011), she was brave and strong and sassy and she was such a great friend to Celia (Jessica Chastain). I think The Help was the first film I saw Octavia Spencer in to be honest. I think my favourite performance from Octavia Spencer as in Fruitvale Station (2013) as Wanda, the mother of Oscar Grant (Michael B. Jordan). Fruitvale Station is a great film that is seriously emotional and Spencer’s performance as a grieving mother is just heart-breaking. Octavia Spencer is also in Snowpiercer (2013), a dystopian film with an amazing cast that STILL HASN’T GOT A UK RELEASE DATE!!! Not even just a DVD release date! I’m not one for illegally watching stuff online or downloading things but I’ve been wanting to watch Snowpiercer for two years now so I may have to compromise this once soon. Also she’s going to play God in a film adaptation of The Shack by William P. Young! 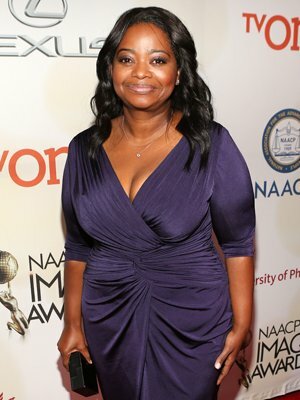 Who doesn’t want to see Octavia Spencer as God?! I remember her from the Oscar when the host asked her to keep an eye on it. It was actually pretty funny. I didn’t see that bit of the Oscars – I hardly saw any of it this year to be honest.